Handmade rosaries, chaplets and catholic jewelry. Announcement Rosaries, chaplets and catholic jewelry, all one of a kind pieces made with love. I love to use vintage religious medals and antique rosary components I get at antique fairs in France,Germany and Belgium. Many parts I use are between 80 and 150 years old. I also use handcast reproduction parts in bronze and silver as well as classic modern parts. They all have separate categories in my shop. Shipping is a flat rate, you only pay for the first item, all others ship for free as long as they can be sent in the same package.All orders have online tracking. Insurance is optional and can be added at checkout. Although it is in german, don't hesitate to contact me; I will gladly translate and answer all questions. I only use top-quality materials: A or A+Grade semiprecious stones, precious metals, artisan made SRA lampwork beads, real swarovski crystal beads,and olive wood from a small family-run business in the Holy Land. If you have any questions, don't hesitate to convo me. 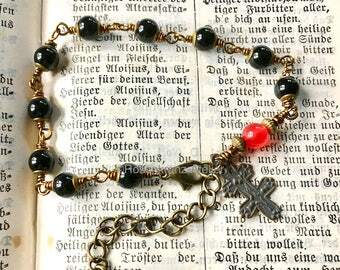 Rosaries, chaplets and catholic jewelry, all one of a kind pieces made with love. Splendid bracelet! It made a great gift for mum. Thank you! Very beautiful! Love it very much! Handmade and one of a kind catholic art. Growing up in a devout catholic family I have inherited the love of the rosary from my parents and grandparents. After completing my master degree in catholic theology, I started work as a teacher. Rosary making came as a hobby first, then I got requests for reparing old rosaries and orders for individual rosaries as gifts for special occasions. I started to roam antique fairs to find replacement beads for old and broken rosaries and discovered a world of beautiful old medals and crucifixes, ready for a new life of prayer. In my shop here on etsy you will find many rosaries with vintage and antique medals, as well as catholic jewelry made with these parts. I also love to work with modern repfoduction parts, especially bronze. All my work is guaranteed one of a kind and comes with a certificate of authenticity and beautifully packed, ready for gift giving. If you are looking for a special individual rosary, please contact me. I would love to create your personal rosary. 1.1 These Terms and Conditions of the company Gerd Fritzsch (hereinafter referred to as "Seller”) shall apply to all contracts a consumer or a trader (hereinafter referred to as "Client") concludes with the Seller related to the seller's goods and/or services presented by the Seller on the electronic platform Etsy (hereinafter referred to as "Etsy”). The inclusion of the Client's own conditions is herewith objected to, unless other terms have been stipulated. 1.2 The controller in charge for data processing on this website within the meaning of the General Data Protection Regulation (GDPR) is Gerd Fritzsch, 1 op der Tonn, 7270 Helmsange, Luxembourg, Tel. : 00352337892, E-Mail: gerd.fritzsch@yahoo.de. The controller in charge of the processing of personal data is the natural or legal person who alone or jointly with others determines the purposes and means of the processing of personal data. To exercise the right to cancel, you must inform us (Gerd Fritzsch, 1 op der Tonn, 7270 Helmsange, Luxembourg, Tel. : 00352337892, E-Mail: gerd.fritzsch@yahoo.de) of your decision to cancel this contract by a clear statement (e.g. a letter sent by post, fax or e-mail). You may use the attached model cancellation form, but it is not obligatory.